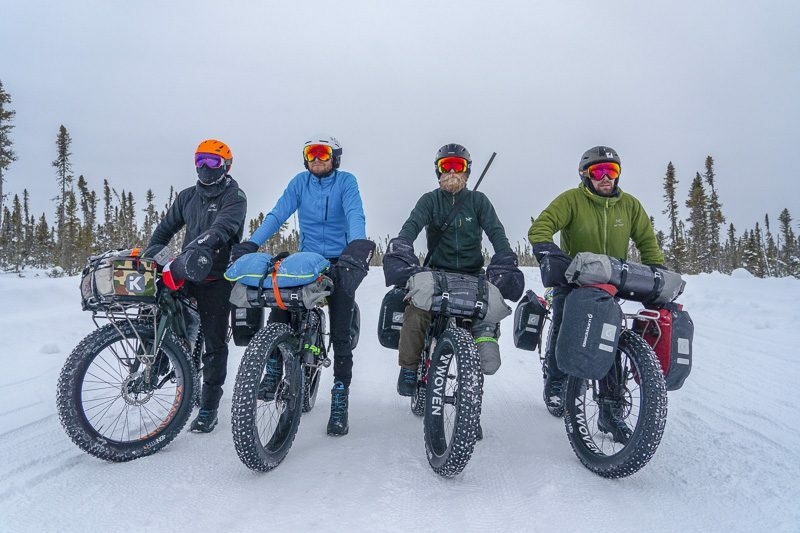 Ted King, Eric Batty, Buck Miller and Ryan Atkins road 600km/372mi for charity in Ontario’s polar bear country, February 2019. 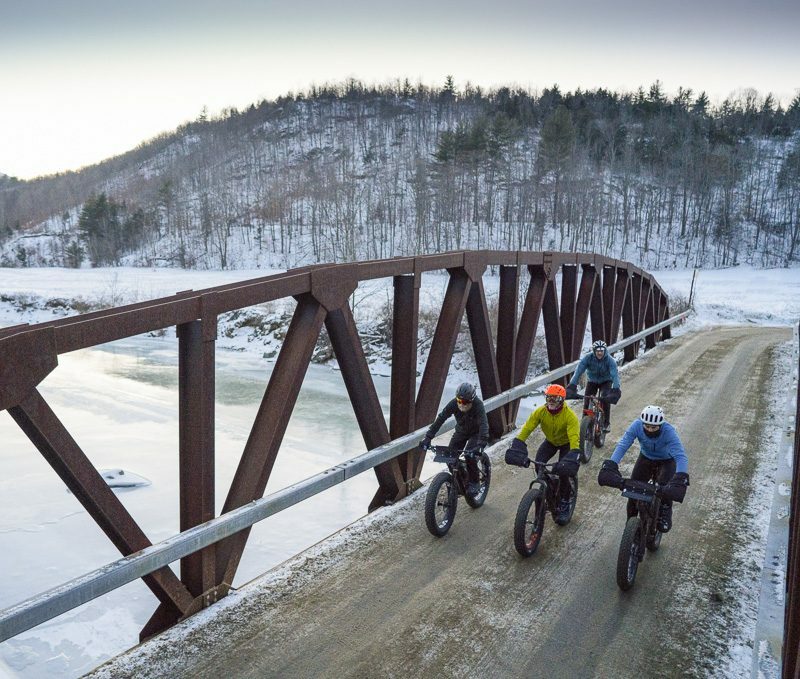 They road Fat Bikes built specifically for winter travel. 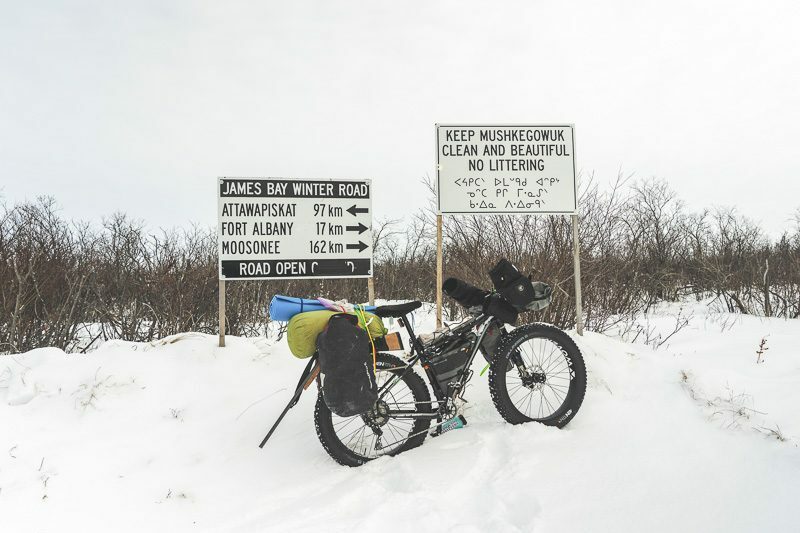 Starting in Attawapiskat First Nation, they crossed into the Territory of Nunavut at Akamiski Island, riding through the communities of Moosonee, Moose Factory and finishing in Smooth Rock falls, Ontario in the heart of Northeastern Ontario. The ride was in support of the Timmins Native Friendship Center and their important work on the James Bay Coast. 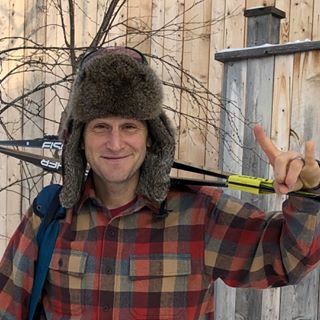 Eric is a former professional mountain biker turned climber, runner, arborist, professional photographer and is the elder brother of 2x olympian Emily Batty. 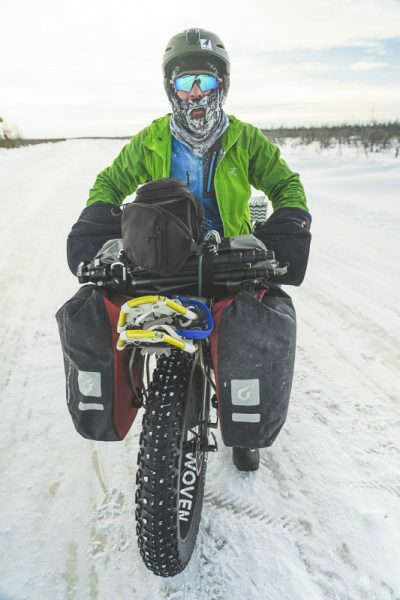 Eric spent years in the family RV traveling the continent racing mountain bikes. One weekend he’d be in the Rockies, the next, Quebec. 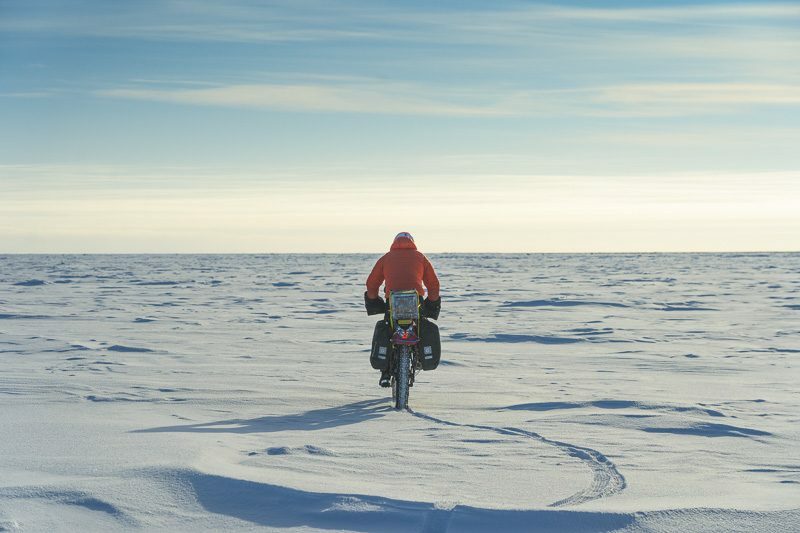 His love for natures largest landscapes kept pulling him away from the bike to experience nearly every aspect of outdoor adventure. Eric was one of 3 on the Crossing Algonquin 2018 trip to celebrate the park’s 125th anniversary. Ryan is bizarre. 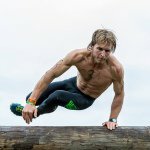 A Civil Engineer by trade, but is currently a full time professional OCR (obstacle course racing), runner, and adventurer. 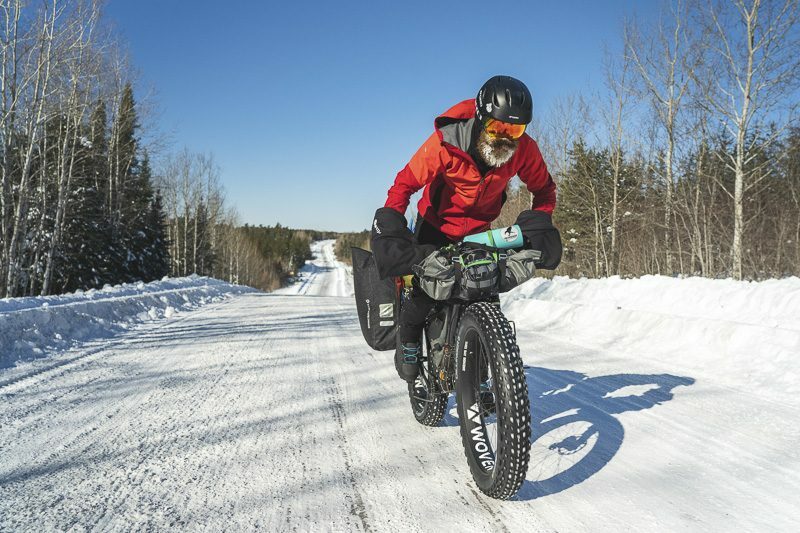 He has raced for the Canadian National Mountain Bike Team, is a 2x world unicycle trials champion, and is considered by many to be the fittest human on earth. He started OCR racing when a friend told him about an event with a ATV up for the win. He won the ATV, and hasn’t looked back. Ryan was on the 2018 Crossing Algonquin team. Ted is a retired World Tour road cyclist. He’s raced the Tour de France twice and every major professional road race you haven’t heard of. 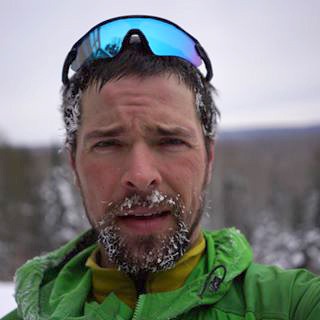 After racing in Europe, Ted moved back to the states to focus on his business, Untapped; a maple syrup based sports nutrition company in Vermont. 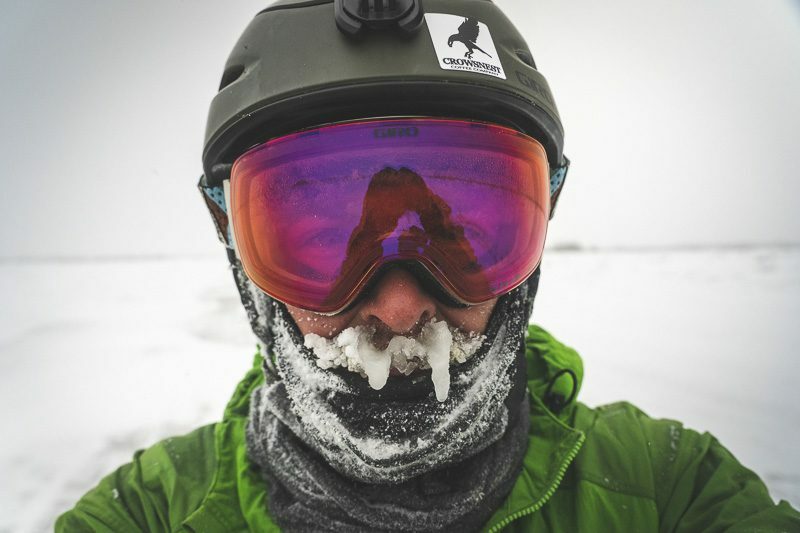 He’s still a whip on a bike, and won the 310k Dirty Kanza gravel race in 2018. This trip was Ted’s first time in Northern Ontario, and first time winter camping. I’m a retired pro road cyclist turned carpenter. For 10 years I raced across Europe, North America and Asia with various teams. Ted and I became friends from our time training in Tucson and my one year stint on a US based team out of Connecticut. After racing I moved back up north. I was born in Smooth Rock Falls and lived in Moosonee for 5 years where my wife and I had our first child. 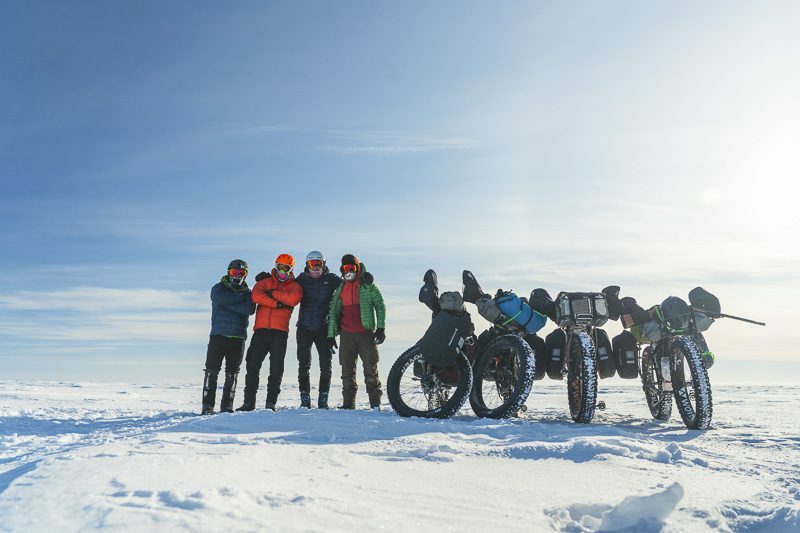 My time on the bike and my love for this region inspired the James Bay Descent and bike racing is ultimately is what brought this team together. We started in Attawapiskat First Nation in the far north of Ontario. It’s a place well known to some for it’s 800km river that offers paddlers a wild, remote experience with untouched wilderness. It’s also well known for things less positive. A 2016 suicide crisis, a boil water advisory that’s gone on for years, an audit and investigation of the chief and band council over money that some say was blown, and others say wasn’t given out in the first place. 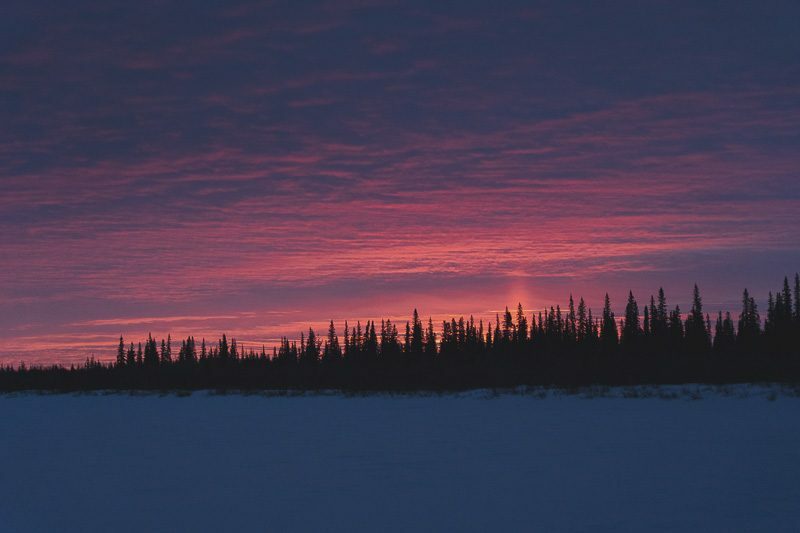 Regardless, “Attawap” is home to many that have a connection with their land that is unrivaled to those living among concrete. 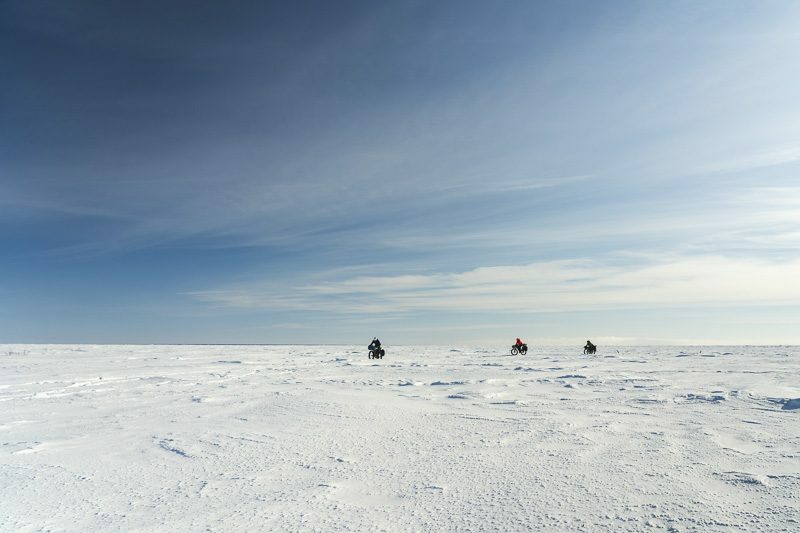 The James Bay Coast is desolate, cold, dark, teaming with wildlife and beautiful. I’ve worked here in the past. Once, I left a leatherman multitool on the roof of an office. I flew back 3 months later to get it while on another job. There isn’t much to do in this town, so those that hunt and fish are absolute masters of the trade. They don’t need the fancy gear from Bass Pro Shops. A torn hoodie and jeans work fine. Many hunters still use iron sights, scopes are reserved for the unskilled that can’t get close enough to kill. This is a tough landscape a distant 500km north of Timmins, Ontario. I remember hearing of a wolf that was injured on a trapline up here in 2012. Word of it and pictures made their way on social media to all the coastal communities. The story was that the trapper brought it home in a skidoo, and nursed it back to health. He kept it on a chain in the back yard a few houses beside the grocery store. It soon gained its strength back and wouldn’t let anyone near it to take the collar and chain off. I was working in Attawp then and was eager to see it for myself, half expecting it to be a dog. There it stood, a large, adult grey wolf, lonely, not afraid, but certainly out of its element. I took a few pictures and left. I heard, a few days later, the trapper killed it because it was too dangerous and “became” mean. Life in the remote north is done differently. It’s what makes it terrible to some and beautiful to others. 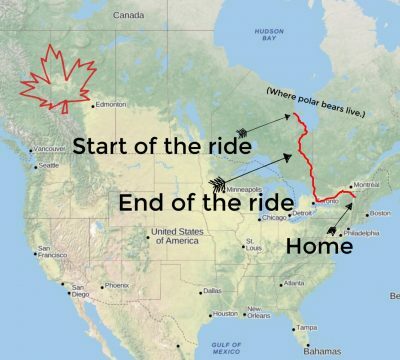 We would ride from Attawapiskat, to the coast and attempt to cross over to Akamiski Island, in the Territory of Nunavut. We’d then head back to the mainland and take a series of winter/ice roads that don’t exist outside of 6-8 weeks in winter. 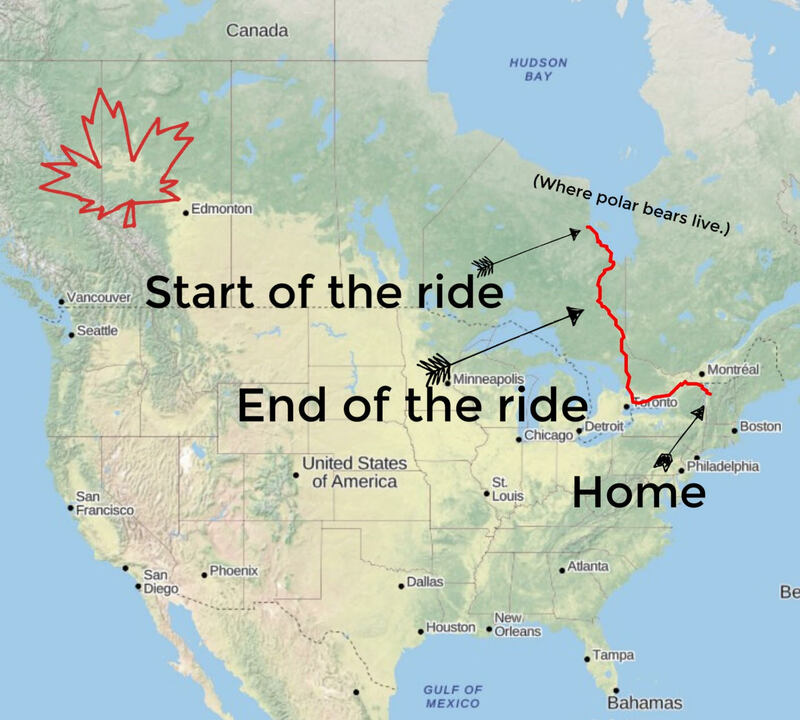 The quarter way mark is Fort Albany and Kashechewan First Nations, on to Moosonee, Moose Factory and end in Smooth Rock Falls, on the Trans Canada Highway, 640km later. Packing our rigs wasn’t easy. There’s only so many places to attach a bag to a bike. Combined, we had about 70L of storage on each bike. 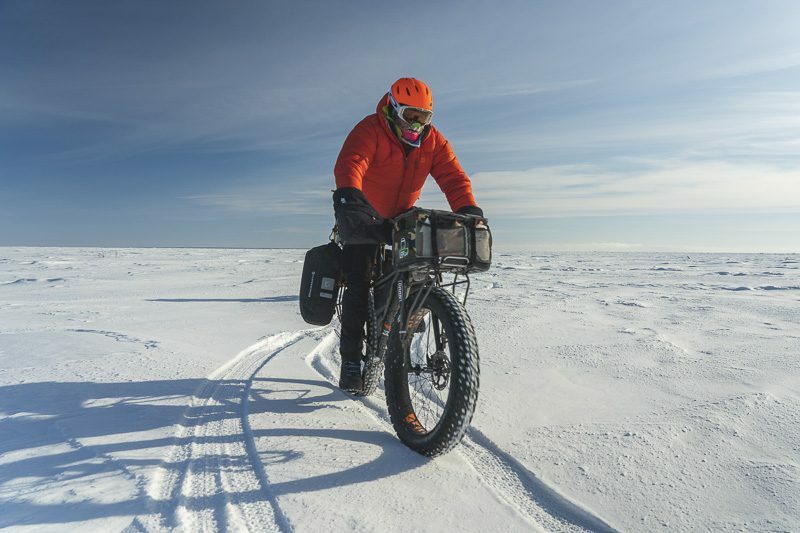 So imagine trying to pack 12 days worth of food (burning over 4000cal a day), enough clothes to keep you warm in -40, sleeping bag, pad, tent, stove, fuel, spare parts, tools, shotgun, spare glasses and more, into one medium sized backpack. We all had a rear rack with 40L in two waterproof panniers and a small space on top for an exterior drybag. We had a triangle frame bag with 10L and a handlebar roll with 15L and a small top tube bag with 1L. The rest of the space, we used Cargo Cages. These are mini aluminum racks you can strap anywhere and hold about 3L each. I had 4 on my bike. Eric’s bike was the exception with front and rear racks to accommodate his camera gear. Our essentials took up so much room that we had to very picky with our clothes. There were no goose down parkas and insulated overalls. 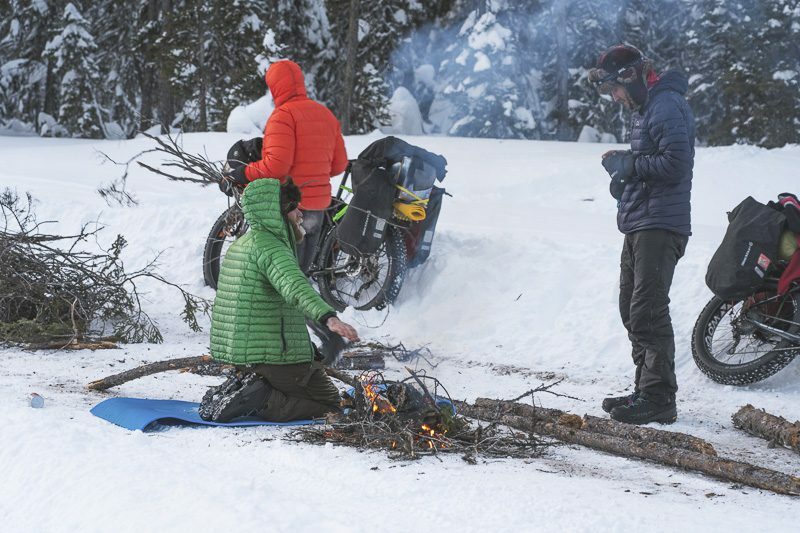 I brought one 550 fill Mountain Hardware down jacket, one Marmot ROM coat, two pairs of pants, one Fjalllraven Brenner and fleece camp pants, two Darn Tough merino socks, and a Kombi Merino Blend Baselayer – top and bottom and a beaver hat. Picking the right clothes for a trip like this can be debated endlessly. We’re burning up all day on the bikes, and we’re hardly moving around camp. To save weight we looked everywhere but the biggest winner was the Timmermade Thrush sleep systems. These are handmade bags custom fit to each of us. There’s no zippers, and our -40 bags weighed only 60oz, or 3.75lbs including the overbags to catch the frost from our warm breath hitting the frigid air. We didn’t have the room to go with a mass produced bag. They’re warm, but bulky. I stored mine in a 30L drybag on top of my rear rack. My food was in the 15L handlebar roll. 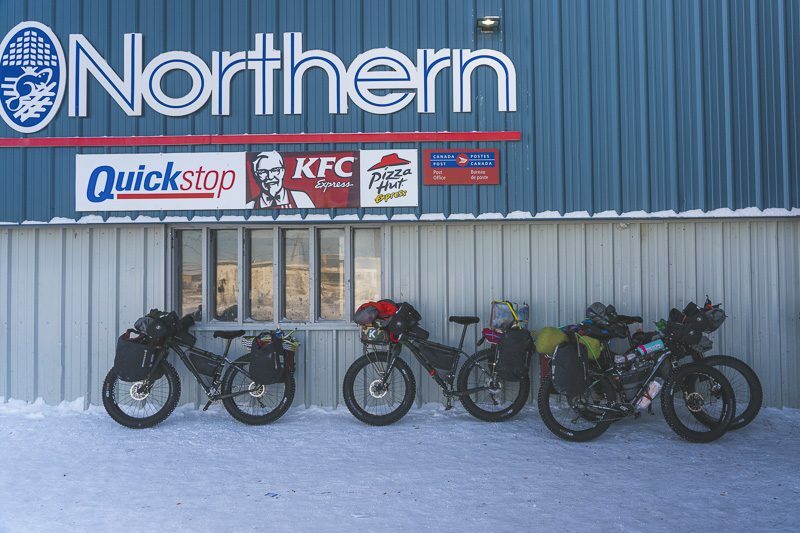 We each had 12 assorted dinners from Alpine Air and Backpackers Pantry we picked up from the AO Oxtounge Lake store. Dehydrated is the only way to go when space is tight. In the end, to make enough room for my necessities, I had to go very light with my clothing choices and I had no margin for error; a style of packing I don’t recommend. Our first night, spent where the Attawapiskat River meets James Bay was tough. 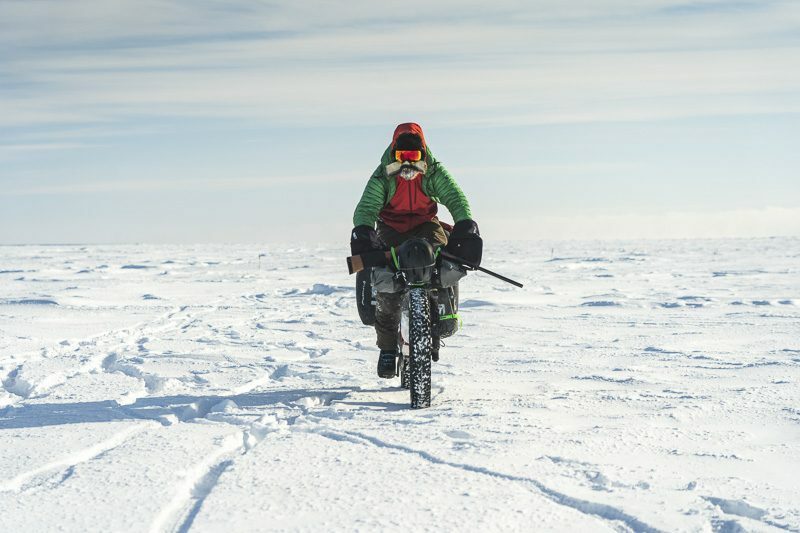 We were on hard ice, with no snow close enough to shovel around the base of the tent. We all had -40 sleeping bags so we were fine with the choice although the night hit -43. Ted and I hardly slept a wink that night, with Eric slightly more comfortable than us, and Ryan was fine. I assumed it was the deep chill I caught while standing in the tipi the night before while setting up the tent, holding the center pole for 20 minutes while the guys pegged it out. Ted wasn’t too proud to tell us that he can’t go on every night if he’s that cold again. We assured him it would get better. Later, we found out he didn’t close his drawstrings around the neck of his sleeping bag! Ouch. Once on the bikes we headed out for Akamiski. There was a long and low cloud on the horizon, close to the thin band of shrubs we could see that make the land we’re aiming for. The day was a snappy -34, clear blue sky and a light wind. We pushed on to cross the official border, but very slowly. 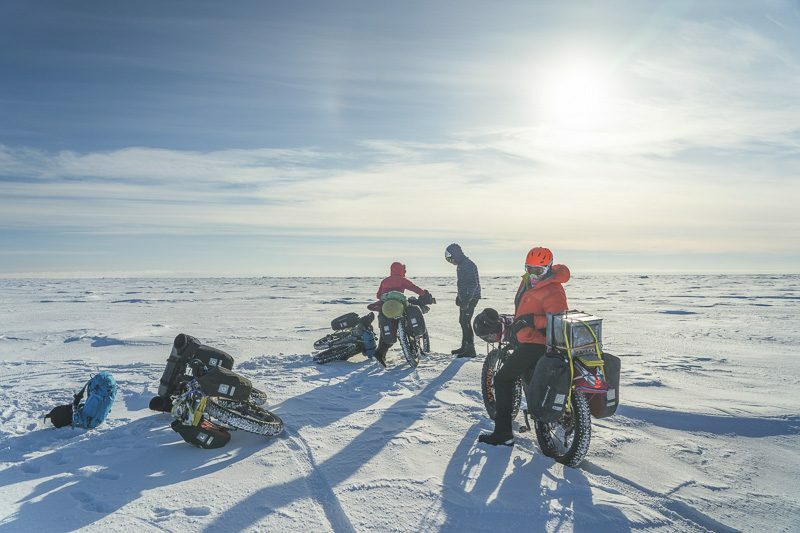 We weren’t sure we’d make Akamiski and back by nightfall and we weren’t keen on sleeping on the ice in polar bear country. 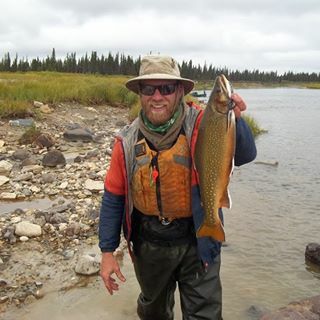 Joe Wheesk, the trapper to Akamiski, whose dad was born there, came by and told us of open water ahead, a long band of it. This confirmed the low cloud, it was vapor from the warm salt water hitting the cold air. He told us a detour around would be 7 miles north, 2 miles east, and then south. This would have added 3 days to our trip. Armed with only a gun and no electric fence to put around the tent, one of us would have to stay up each night on bear watch. This wasn’t an option. We had 80-120k a day planned ahead of us. We needed the rest. 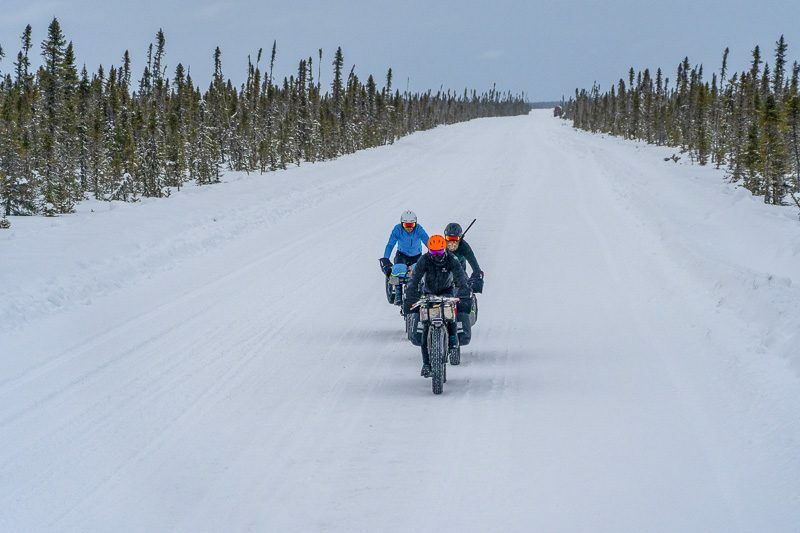 We decided to ride the James Bay Winter Road to Moosonee and not put our tire tracks on Akamiski. South we headed. The road was terribly rough. Smooth Ice, you could skate on, but lumpy and bumpy, like a toads back. We were having a hard time with our tire pressure. We rode 45NRTH Dillinger 5 studded tires. Once we dialed the PSI back to 3 or less, we had great traction and we stopped counting the crashes, some were spectacular and gave us all a good laugh. 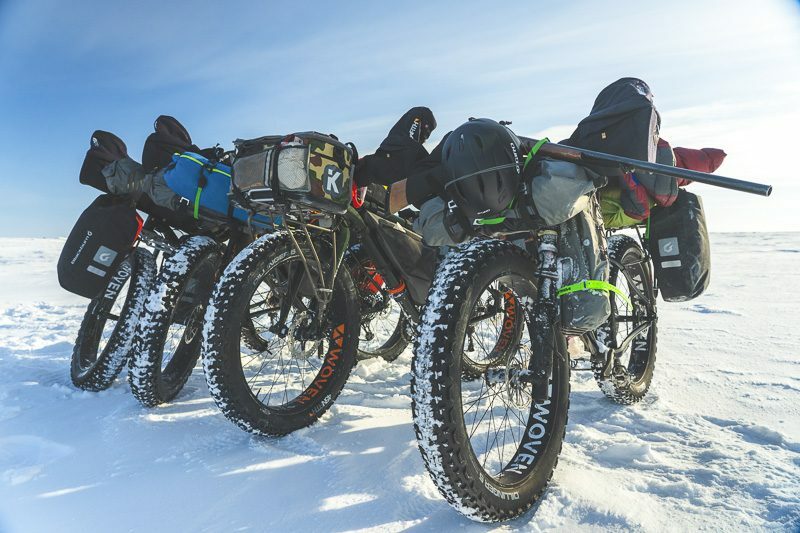 Our first three days we rolled 50, 100, 120km with little to no snow. Overnight temperatures were -35 with days being around -25. The wind seemed to love us. 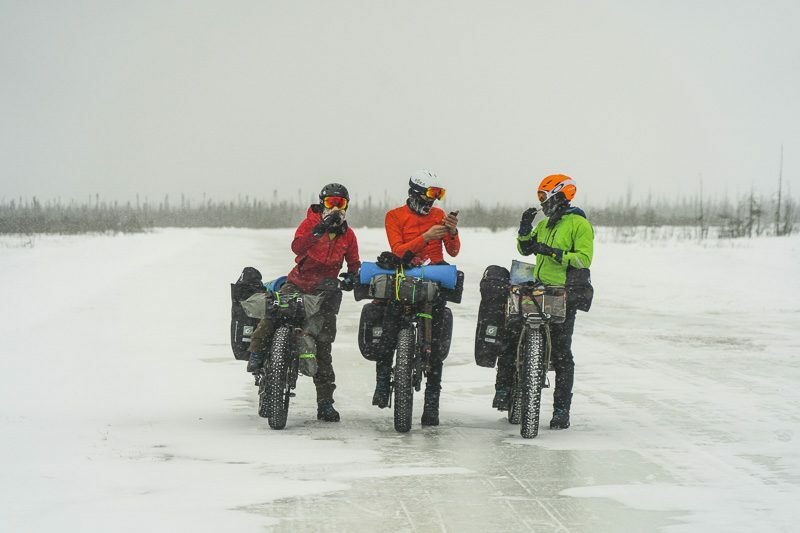 Tailwinds all the way to Moosonee kept our spirits high and our legs fresh. Little did we know what the second half of the trip was going to end up like. We set up camp on day 4 just 4k north of town. Locals told us of a big storm that was en-route. That night Eric woke up at 2:45am and sounded the alarm. The tent was about to buckle under the weight of the snow. He and Ted shoveled it off with snowshoes while Ryan and I stole more time in our sleeping bags. I remember the single, center tent pole in the shape of a ‘C’. We got lucky. The winds kicked up to 70kph and didn’t let up for 18 hours. The winter road was closed and wouldn’t open for another three days. 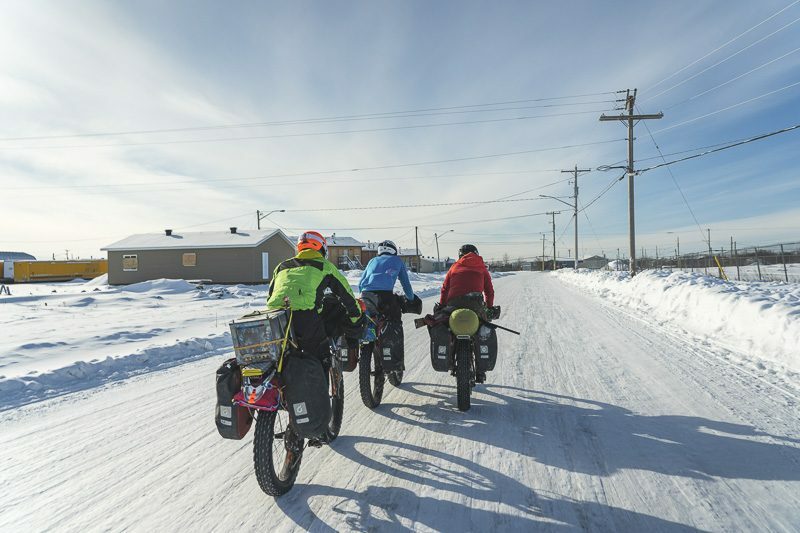 The team decided we’d head to Moosonee and make a planned stop at a school to talk about the trip, our bikes, and how awesome living a healthy active lifestyle is. The kids and staff were amazing, asking all kinds of questions and were blown away by the size and weight of our bikes with 5 inch tires weighing nearly 100 pounds. Then, we made a quick stop at the beneficiary of our Gofundme page, the Moosonee Office of the Timmins Native Friendship Center. We raised $7,783 for the TNFC. We’re told they’re buying new sports equipment with the money. We hunkered down in Moosonee that night and decided to roll out first thing the next morning. With half the trip behind us, we started the last 300k unsure of what to expect. This road is very different than the road North. 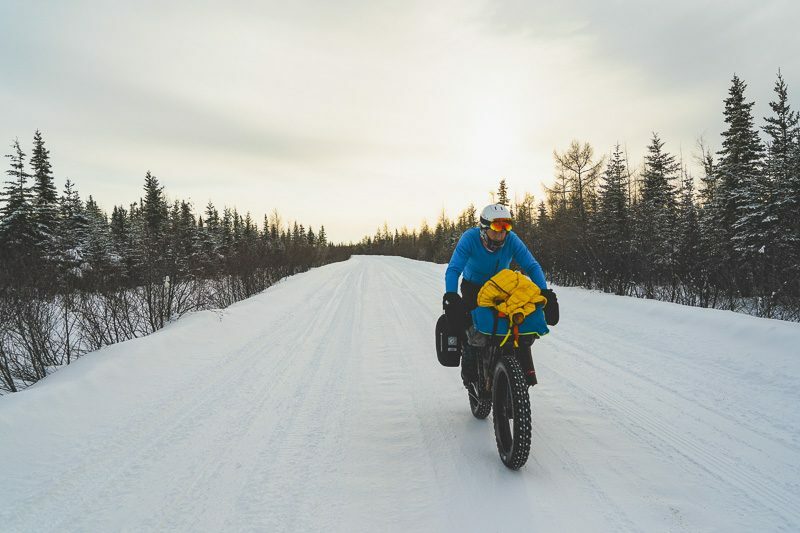 The Wetum road is always snow covered, full of ruts as it doesn’t get watered, only plowed, and no fat bikes have ever been down it. The storm literally made the road disappear for the entire length. Rolling out of Moosonee, a family stopped us on the ice road crossing the Moose River and handed us money for the Friendship Center. Word spread far and wide up here, every community knew about the expedition which was nice to see. We had people looking out for us everywhere we went although, we didn’t really know it at first. On the back side of the Moose River we passed the first grader of the day that was tasked with opening the road. The driver told us we won’t make it more than 10k. He was right. This defined the next two days. We were constantly being held up by heavy equipment as they worked hard to open the road. One of the operators even made us a snow block so the 50kph wind wouldn’t kill us as we sat there for over an hour in a wide open swamp with trees the height of a child. 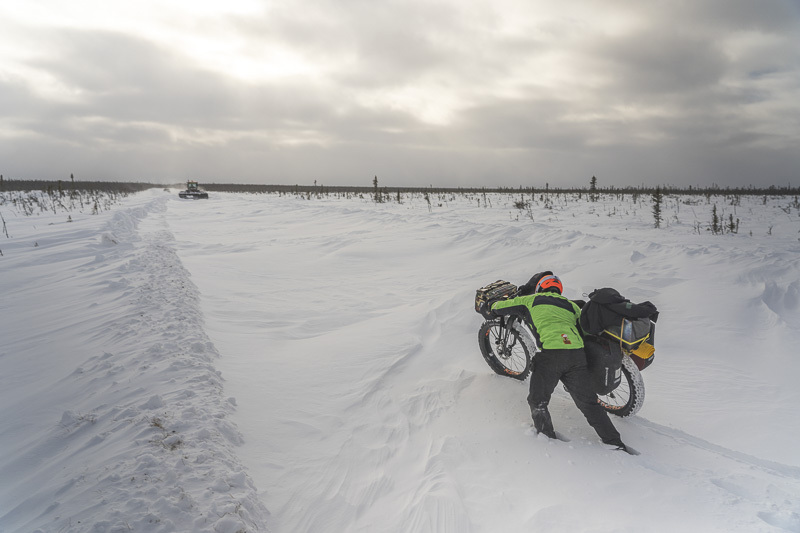 It wasn’t until day 8 that we finally got passed the last snow plow by pushing our bikes in 2 feet of windswept snow a few hundred yards to where there would be no more heavy equipment and closed roads. By this time, we had 450k behind us. We put the hammer down but the roads were still soft and rough, with no hard or smooth areas to be found. We would stop every 10k, or 45 minutes for food and a hot drink. We each had a 40oz Hydroflask with hot water every day, that way our frozen snacks would soften up when we took a drink making eating much easier. Our stops were never longer than 2 or 3 minutes, otherwise we’d freeze up. 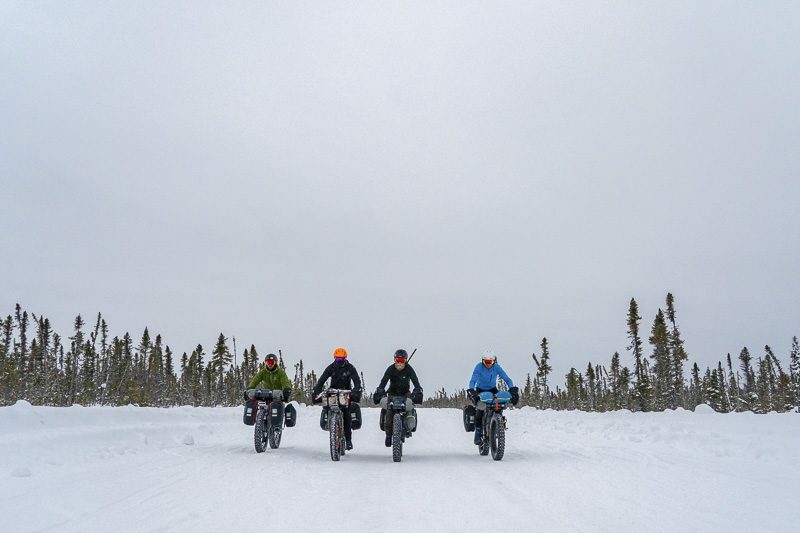 We ended day 7 after 110k or so and with this leg behind us, we became the first group to fat bike the entire James Bay and Wetum Winter roads unsupported. Two riders did go from Attawapiskat to Moosonee, supported, in two days, staying in a B&B. 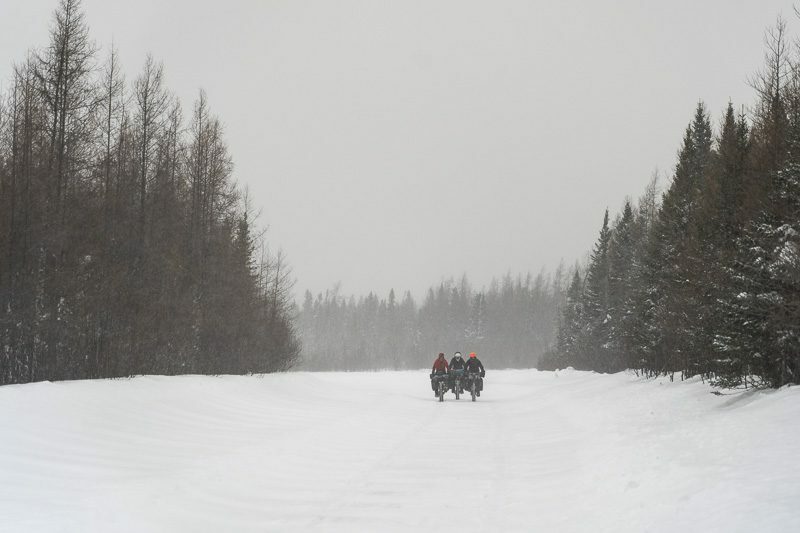 One rider attempted to go from Moosonee to Attawapiskat but had to quit and called for the police to get him as he reportedly had severe frostbite on his feet. 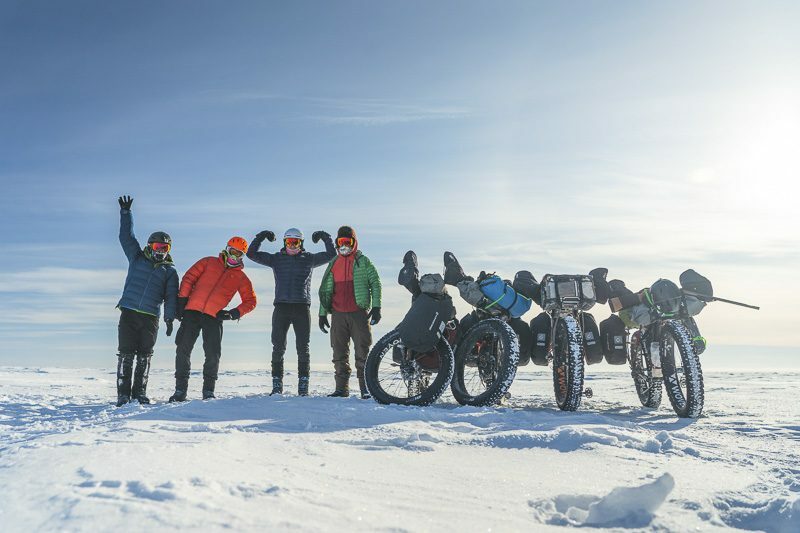 Not to diminish their rides at all, because riding a bike up here in the dead of winter is an accomplishment on it’s own. It’s bloody hard. All that lie ahead of us now was 78k of forest access road from the Abitibi Canyon to Smooth Rock Falls. Our last day was my favorite. Not because I wanted the trip to be over, but because it was the first day that sweat and moisture management didn’t matter. 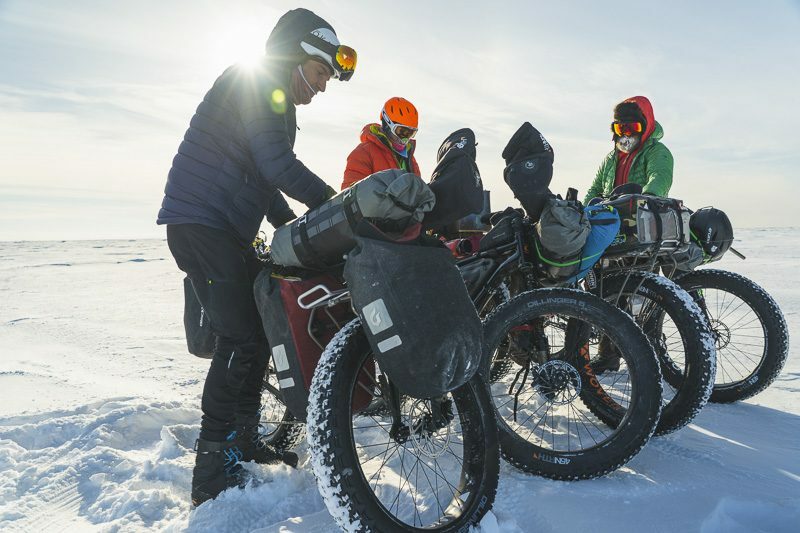 For 9 days we delicately danced around riding fast enough to stay warm but not going to fast as to soak our clothes through. Our little stove is just enough for comfort, not drying layers of gear for hours on end, it would take more time than we had. So most of our days were spend at a touring speed. Day 9 was different. We could ride as hard as we would like. 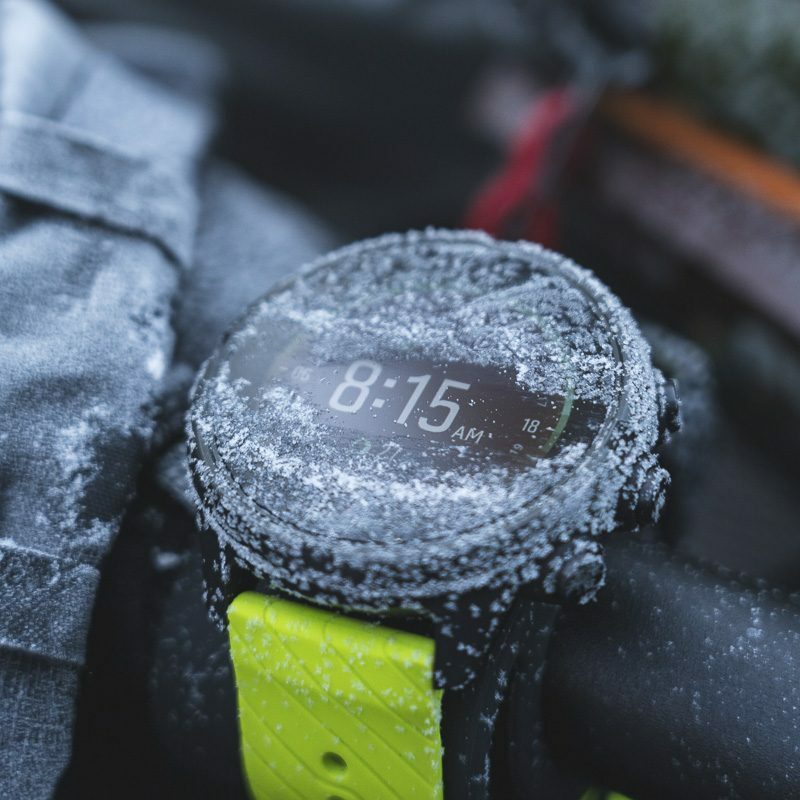 Taking turns at the front, rolling through like the slowest, most iced up echelon cycling may have ever seen. A few minute pulls at the front, giving the rider on your wheel a break, one after another for 3 hours and 10 minutes. 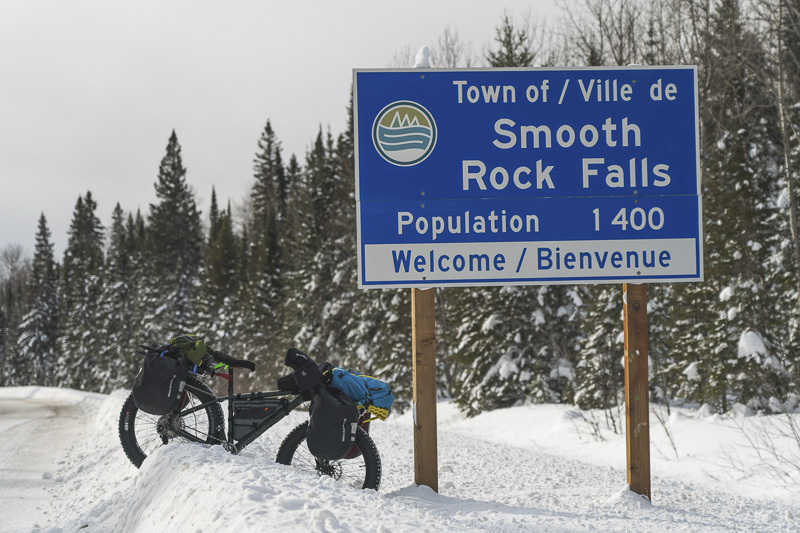 We put the 78k behind us when we came up to the Smooth Rock Falls town sign. It’s customary in cycling for a group to sprint to every town sign they see. It gives even the slowest cyclists a flood of adrenaline to kick it as hard as they can among their friends and for a moment, you get to feel like you’re in the last 200m of a flat stage in the Tour de France. In the end, Ryan waxed Ted and I while Eric rolled ahead earlier for footage and extra photography opportunities. We were greeted by the Mayor and town staff. They were so kind to give us a meal and hook us up with the local Skidoo dealers (Paps Power Shop) personal cottage to spend the night. We headed over to another school for a talk in the morning as well as the regional Detox Center which used to be the hospital, where I was born. On the long drive home we reflected on the James Bay Descent. Our sentiments were similar. The land was so tough and unforgiving, and very different than most of us were used to. The people were second to none; an elder from Fort Albany, on day 6, gave us an offering of tobacco to put in campfire while we were setting up camp and asked his creator for safe passage over their traditional land. So many people stopped to talk, and ask us if we needed anything that we eventually had to just keep going when we saw them slowing down to keep on schedule. The night sky was grand, black and dotted with a million stars. The whole experience left all of us wanting more from this area. 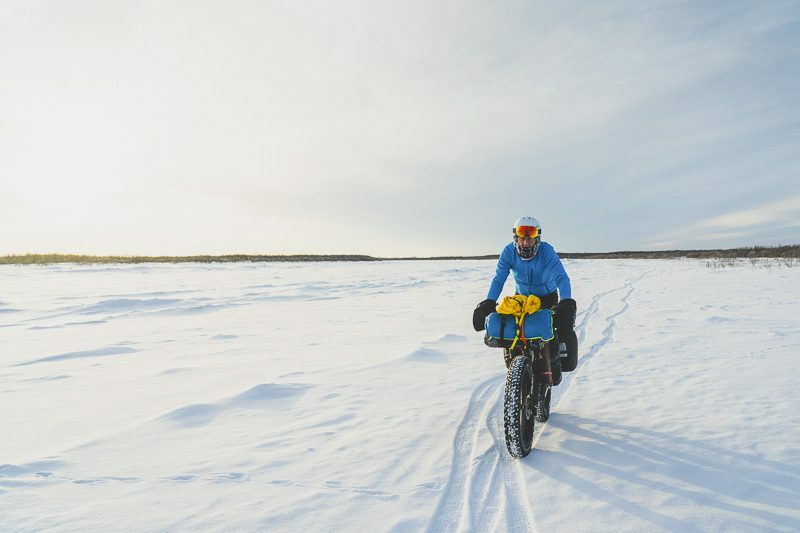 We all agreed, there’s no doubt that the ability of Fat Bikes is opening up new routes and ways to adventure and allowing access to places that bikes couldn’t go before. 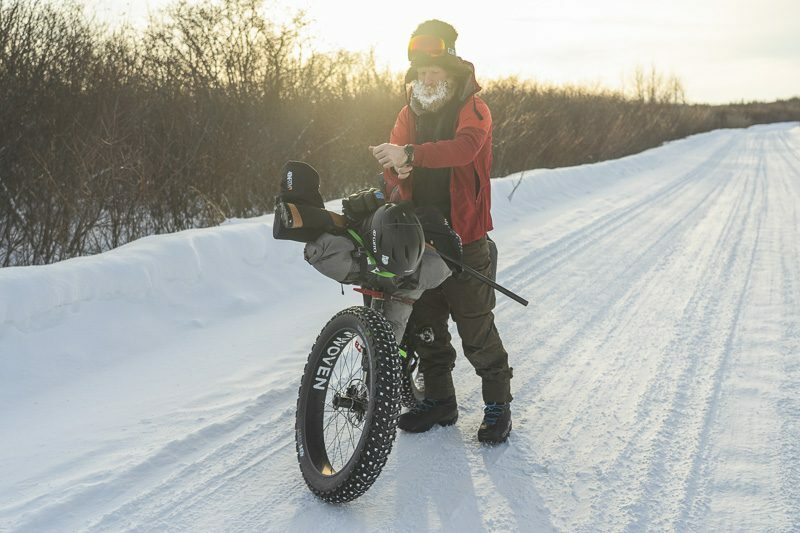 That may be a rail trail close to home or 638k down James Bay, but the Fat Bike is here to stay.